Which type of charter is suitable for us? 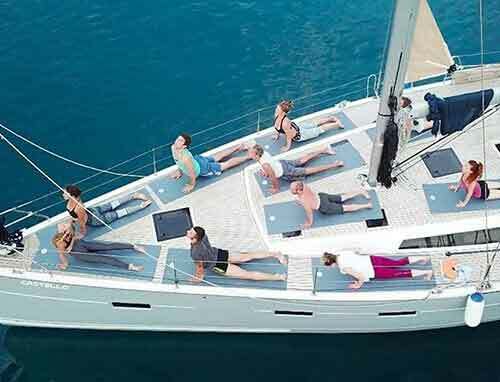 Private Gulet Charter: Chartering a private gulet offers you ultimate comfort, privacy and flexibility on the menu, itinerary, provisioning. 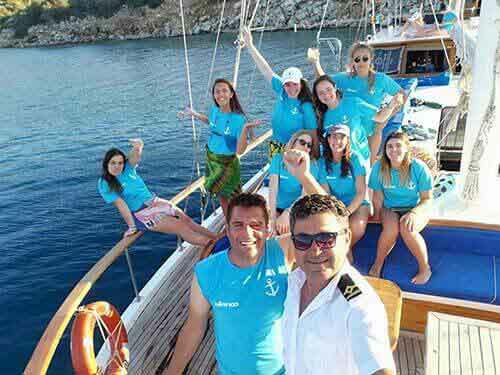 The Gulet and crew are dedicated only to your party. 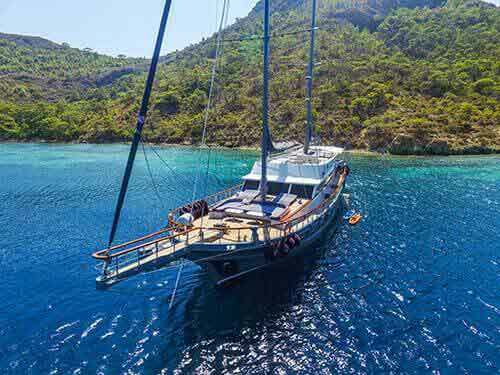 On our fleet you can choose a gulet starting at minimum 2 cabins to 16 cabins for your party. Cabin Charter: If you have difficulties to compose a group or if you want to be alone you can join one of our regular tours and charter one or more cabin. You will have a chance to meet people from all around the world while enjoying one of the most unique and relaxing holidays in the Aegean. As the Cabin Charter reservation continue until the last minute, we can give the boats name one day before the departure. The itineraries, menus and ports of embarkation and disembarkation for the Cabin Charters are fixed and cannot be altered. Do I need any qualifications for sailing on board? No qualifications are required for skippered, crewed or gulet holidays. For skippered holidays you can assist in handling the yacht according to the skipper’s instructions or you can just watch and relax with sailing. Can I visit some Greek Islands? We can design an itinerary that includes one or more of the Greek islands. Please be aware that Greek Port duties are not included in the prices. Those fees must be paid by charterer when entering Greek harbours. Is smoking permitted on boat? Smoking is not permitted inside the yachts for safety reasons and for the comfort of future charter guests. If you are a heavy smoker you can smoke on the deck. What is included in charter fees? All charter and berth taxes, transitlog, autopilot, cleaning, base mooring fees, gas, domestic water, bed linen equipments, dinghy with outboard. Can I plan my own itinerary? It is possible for Private Yacht Rentals but not for Cabin Charter tours. Cabin tours are made according to pre-scheduled programmes. At least two swimming suits. High protection sun lotion, sun protection cap, protection lipstick, the attire should be according to warm (night) – hot (day time) temperatures, camera or/and handy-cam, beach towels and personal towels. A memory book to note your happy moments. No shoes are allowed on board, just bring your sneakers or walking shoes for land cruising. Yachts do not permit guests to bring pets on board for several reasons. Crew is required to maintain rigid cleanliness standards for all their guests and there is a potential of allergens from animal remaining on board. Animals are typically not accustomed to the strict confinement of a ship and an active cruising can be quite uncomfortable for pets. Just like humans, animals can also be sensitive to the effects of motion and may become disoriented or lethargic. What is not included in charter fees? Private Gulet Charter: Harbour taxes and mooring expenses in Greek waters, the meals, soft drinks, drinking water, alcoholic beverages, land excursions and airport transfer. Cabin Charter: Soft drinks, bottled water and alcoholic beverages; these can be bought from the bar on board. Land excursions and airport transfers. April, May and October’s temperature range between 20 and 26 degrees centigrade and are much cooler then at the height of the season. Temperatures for June, July and August are hot, ranging from 30 to 38 degrees centigrade. It is not humid and unlikely to see rain at the height of summer. What are the differences between Standard, Standard Plus,Luxury and Ultra Luxury classes yachts? Standard Yachts: Boats in this class are designed in the same structure, there is no air conditioning. Each cabin has a private shower and toilet. Rental prices are affordable. Standard Plus Yachts: They are the Standard boats with air conditioning. Rental prices are affordable. Luxury Yachts: The boats in this class have cabins larger than those of standard vessels. Each cabin has a private bathroom and air conditioning. Suitable for rental rates. 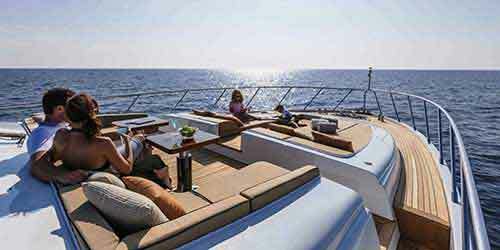 Ultra Luxury Yachts: Ultra Luxury boats have been designed taking into account the needs of all types of guests who are looking for a custom-made. All the rooms are all air-conditioned and individually decorated. No expense was spared. Boats are equipped with the latest technology equipment. Rates are also determined by taking into consideration. How many crew are on the boat? It depends on the yacht size. 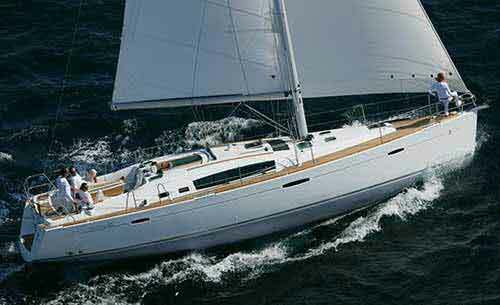 But normally 2 crew for 4 cabin yachts, 3 crew for 6-7 cabin yachts and 4-5 crew for more than 8 cabin yachts. Can I arrange land excursions during the charter? For the Private Yacht Rentals we can organize a special land tour for you. 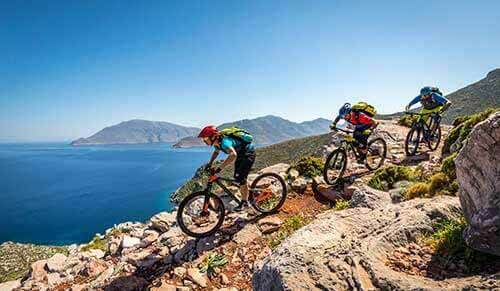 For Cabin Charters you can join our regular Dalyan-Caunos or Village tours. Can I bring snorkeling equipment? Certainly! It is actually advisable to bring your own snorkel. There are usually masks on board, however you can never be sure how many people have used the snorkel before you. Scuba diving equipment is not advisable unless you have booked a scuba holiday. There are areas in the Aegean and Mediterranean where scuba is prohibited. How much do I tip the crew? A crew gratuity is both customary and discretionary. 5% of the base charter fee is usually the norm depending totally on your discretion. It is usually given to the captain at the end of the charter and divided equally among the crew members. You do not have to give a tip, it depends on you. Can you cater special diets? We can cater all kind of special menu for Private Yacht Rentals. For Cabin Charters only for vegetarians, we serve alternative menu. Can I embark or disembark from different harbours? This maybe possible except cabin charter, but you will be charged an additional cost. The cost varies according to the distance between the two harbours. Please ask for the one way supplements. The situation is hard to predict. In fact you may be the best judge based on previous experience. If you are worried about seasickness check with your local pharmacist for special medication before you leave home. If you are new to yacht chartering, let the crew know; they will make your trip as comfortable as possible by recomending routes in protected waters and keeping tabs on changing weather conditions. Do I need to buy an insurance during the charter? Your charter agreement will detail insurance provisions: the yacht remains insured by the owner during your charter, however we advise all charterers to consider cancellation and curtailment insurance. You may also consider Personal Accident or Medical Insurance plus Personal Effects Insurance, which is generally not included in the Charter Fee. Can I take babies on board? Yes, you can take babies on board only for the Private Yacht Rentals. But it is not allowed to take a baby or a child under 12 years old for the Cabin Charters. Can I bring drinks on board? It is possible to bring your drinks from outside to the boat only for Private Yacht Rentals. But it is not allowed to bring your drinks to the boat for Cabin Charters. Drinks can be bought from the yacht’s bar. Yes, we can arrange all kinds of transfer depending on your request. What is the charter time schedule? All charters begin by 15:30 on the day of departure and typically end at 10:30 a.m. on the day of arrival. These timings between charters are necessary to ensure that yachts are always delivered to the next charter in perfect working order. Can I bring my laptop on board and how can I charge my mobile phone? As you know to charge the electronics you need 220 wolts. Therefore we don’t have 220 volts in every boat but we can help you if you inform us before. What do I do on a charter? You sunbathe, shop, surf, rest, jet-ski, eat, go to night clubs, fish, read, drink, dance, swim, sail, relax, visit ancient cities, sing sea chanties, interact with your significant other or take advantage of the opportunity to just “be alone”.